Ecosystem Collapse: Most Important Fish You’ll Never See? T here were billions of Menhaden running from Nova Scotia to Maine, down the East Coast and all around the Florida Panhandle over 150 years ago, and 100 different companies processing them to replace whale fat. While considerably smaller today at around 12″ per adult fish, each Menhaden filters four gallons of water a minute at the lowest estimate, 7 gallons at the highest. Clean water is important, but even more so is the staving off of an ecosystem collapse. 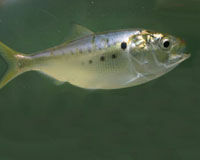 Menhaden eat algae (phytoplankton) which prevents algal blooms. We know algal blooms causes dead zones in bodies of water. Getting sunlight to beneficial plants at the bottom of the ocean to receive those life-giving properties is another outcome of Menhaden’s clean-up job. As Menhaden eat the algae they become rich with omega 3 fatty acids and are a fine and tasty meal for dozens of fish we eat, and several species of birds. And it’s because of the Omega 3s that their fate seems sealed – industry is hungry for cheap sources of Omega 3s for vitamins, cosmetics and other items. This entry was posted in Animal Welfare, Mary Haight and tagged ecosystem collapse, food chain, menhaden extinction on June 27, 2012 by Mary Haight. It is really great that I have found this informative article. With your help I have found the problem, which has that application. Thanks a lot for sharing this great entry and I will be waiting for more great and useful information from you in the nearest future.